Above, Scott Lynch got a shot of Malcolm D. MacDougall III’s “Microscopic Landscape 2010,” a 24-foot long, 7,500-pound sculpture that “finds its inspiration in the multi-faceted structures and activities seen on the molecular level,” according to a press release. 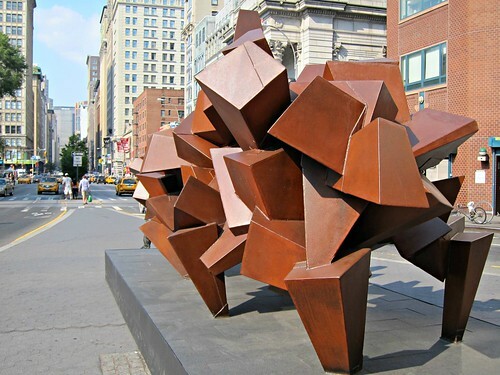 It will be on display in Union Square’s Triangle Park through January 2013. The folks at the CBGB Festival send word that they’ve finalized the lineup for their summer festival, and tickets for film screenings go on sale Monday. Among the 300 bands playing are Agnostic Front, Fishbone, Superchunk, Clap Your Hands Say Yeah, JD Samson & MEN, MXPX, Reggie Watts, The Dirty Pearls, LA Guns, David Johansen, Guided By Voices, Pains Of Being Pure at Heart, Cloud Nothings, War on Drugs, The Virgins, D Generation, and The Cro-Mags. More info here. DNA Info reports that at a heavily protested meeting at Cooper Union yesterday, the city’s Rent Guidelines Board voted to increase rents by 2 percent or $20 (whichever is higher) for one-year leases and 4 percent or $40 (whichever is higher) for two-year leases. The Post points out that the increases were the lowest in a decade. At the sentencing of Oscar Fuller, who punched her into a coma during a dispute about a 14th Street parking space, Lana Rosas says, “the only thing I want to do is spit in this dude’s face, which I’m not going to do,” according to The Post. According to Velvet Roper, Philip Glass’s piano malfunctioned during his concert at Battery Park, which was attended by some 5,000 people despite the heat. And how did some people deal with the weather yesterday? By hitting the Russian and Turkish baths, of course! “Once you go outside in the 90-degree heat, it feels like nothing,” the sauna’s manager tells The Post.